Since the release of Heart of Thorns and Raids, the “Looking For Group” (LFG) Tool in Guild Wars 2 has become ineffective. Don’t get me wrong, it still functions and you can still find groups, but but the LFG tool has devolved into an unorganized mess that makes it difficult to find what you’re looking for. Although there are several issues that have led to this current state, I believe that a few small improvements can make the LFG tool much more effective and intuitive to use. Here is a list of some of the problems with the current LFG tool. Although ANET has said that Raids were not included in LFG because they aren’t meant for pick-up groups to play, it hasn’t stopped players from flooding the LFG tool with Raid parties. At this point, it only makes sense to offer a separate category for Raids if for no other reason than to keep the LFG tool organized. Searching for map meta events is unnecessarily difficult. There needs to be a separate section for players to find meta events in maps like Dry Top, Silverwastes and all of the Heart of Thorns maps. As it stands now, the meta event parties only add to the confusing mess that is the default Open World Content category. Currently, there are too many advertised parties that are not in their appropriate LFG category. One of the reasons this happens is that players are not required to select a category when listing their party. As a result, many parties are advertised in the “default” Living World category which happens to to be the first one on the list. That is why you see parties for dungeons, fractals and many other out of place parties listed in the Living World LFG section. This is a basic quality of life improvement and one that should be fairly simple to implement. Let players search for groups based on keywords that can be entered in a search bar. Furthermore, it would be nice if players could filter the specific categories that they wish to see. Here is a list of suggestions to improve the LFG tool, including a mock-up of a proposed “LFG Tool 2.0”. The new category “Current Map/Instance” becomes the new default category for the LFG Tool. This is a dynamic category that changes based on the map or instance that you are currently in. So if you are in Dragon’s Stand and open the LFG tool, the first thing you’ll see is the Dragon’s Stand LFG panel. If you are in a dungeon you’ll see the LFG section for your specific dungeon. This also applies to advertising your party, meaning that if you are in Dragon’s Stand and decide to list your party, it will default to the Dragon’s Stand LFG section. Players outside of your map/instance can still see your party by browsing to the appropriate section. The goal of this default section is to intuitively guide players to the appropriate LFG category in order to increase organization and generally make the LFG tool more effective. A search bar a the top of the LFG panel allows you to filter your results by keyword. For example, typing “chest” into the search bar would return groups that contain that keyword, like “SW Chest Train”. 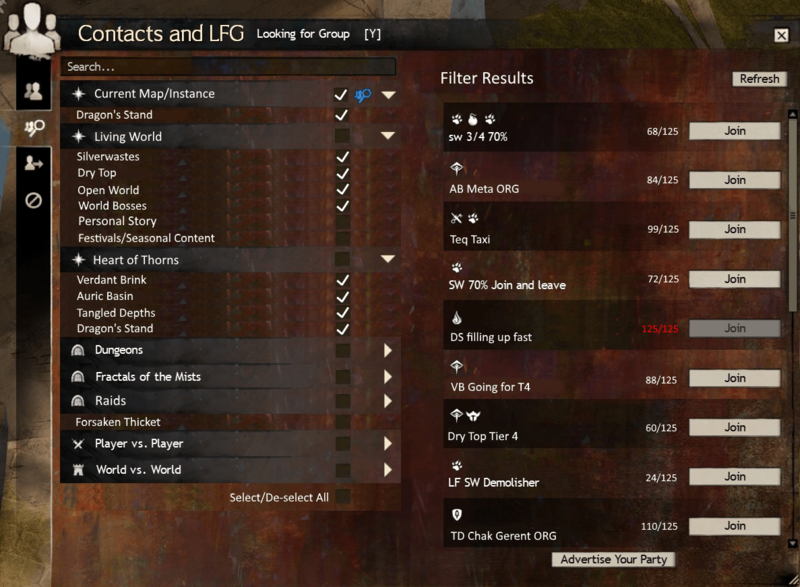 Each LFG section has a check-box that allows players to chose which LFG categories show up in the filtered results list. For example, using these check-boxes a player could filter out everything except Heart of Thorns meta events. 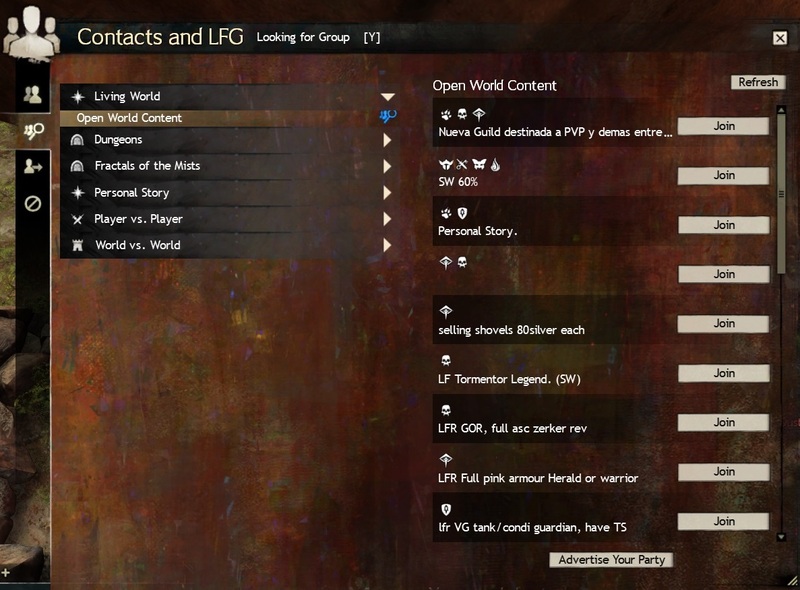 A map population counter is shown next to the join button of each LFG party. This allows players to see how populated a specific map is before deciding to join. If the map is full, the population counter will be red and not allow players to join. This would prevent players from having to click join just to see if there is space available. There is a separate category for raids that can expand as new raids are introduced. This will reduce much of the clutter that plagues the open world content category. This section would also allow squads to be listed so that players can join directly from the LFG tool. Each meta event map is given its own section located under either the “Living World” or “Heart of Thorns” categories. This provides a more organized way for players to find the meta event groups they’re looking for. The Living World category contains sections for Silverwastes/Dry Top meta events in addition to new sections for world bosses and seasonal content/festivals. Also, the personal story category has been combined into Living World. While it’s unlikely that ALL of these improvements will be implemented, one thing is clear: the LFG tool needs to be updated. The release of Heart of Thorns and Raids have magnified the weakness of the current LFG implementation as seen through its obvious ineffectiveness. An improved LFG system will benefit all players and Guild Wars 2 as a whole.